A majority of Americans now favor gun ownership over gun control and want to own firearms for protection. Pollsters attribute the changing attitudes to the perception of rising crime rates that goes against official figures. Analysis of the most recent Pew Research Center poll showed that 52 percent of Americans believed it was more important to protect the Second Amendment rights to own firearms, while 46 percent favored controlling gun ownership. In 1993, only 34 percent favored Second Amendment protections, while 57 percent were for gun control. Support for restricting the use of guns has dropped most dramatically among white Americans who believe crime is on the rise. Just 37 percent among that group favor stricter gun laws, compared with 78 percent in 1990. However African-Americans also went from favoring the view that guns put people’s safety at risk (53 percent in 2012) to believing guns prevented people from becoming victims of crime (54 percent in 2014). Today, 63 percent of Americans believe having a gun in the house makes them safer, and only thirty percent think otherwise. In 2000, that proportion was inverted, with 51 percent believing having guns in the house was more dangerous and 35 percent thinking it safer. While figures from the Bureau of Justice Statistics indicate that the actual rate of violent crimes was close to a 20-year low, 63 percent of Americans thought crime in the US was on the rise, a 2014 Gallup poll showed. Pollsters were at a loss to explain the discrepancy. “We are at a moment when most Americans believe crime rates are rising and when most believe gun ownership – not gun control – makes people safer,” wrote Andrew Kohut, the founding director of Pew Research Center. “Why public views on crime have grown more dire is unclear, though many blame it on the nature of news coverage, reality TV and political rhetoric,” he added. In the 1990s, Americans worried about violent crime tended to favor stricter gun control laws. Today they are more likely to favor gun ownership instead. “People who thought crime rates were increasing were 9 percentage points more likely… to support stricter gun control laws. Today, they are 8 points less likely,” Kohut said. He pointed to a 2013 Pew Research survey showing that protection had become the top reason for gun ownership. 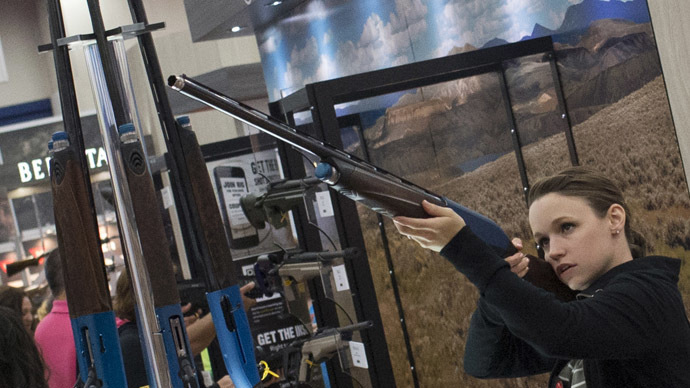 In 1999, the top reason cited for gun ownership was hunting.